Performances of high quality, China’s Ding Ning and Liu Gaoyang duly booked their places in the semi-final stage of the Women’s Singles event at the Seamaster 2018 ITTF World Tour Asarel Bulgaria Open in Panagyurishte, following success on the morning of Saturday 18th August. Both accounted for most noteworthy Japanese adversaries, players we may well see on view at the forthcoming Tokyo 2020 Olympic Games. Ding Ning beat Kasumi Ishikawa (8-11, 12-10, 7-11, 11-4, 11-8, 11-7), after Liu Gaoyang had started the day by overcoming Miu Hirano (11-8, 11-9, 2-11, 11-7, 11-4). Success and it was success contrary to seeding; Ding Ning started play, the no.6 seed, Kasumi Ishikawa was to top seed. Similarly, Miu Hirano occupied the no.3 seeded berth; Liu Gaoyang had been required to compete in the two day qualification tournament. However, the outcomes were hardly upsets, both Ding Ning and Liu Gaoyang being reigning Olympic champions! 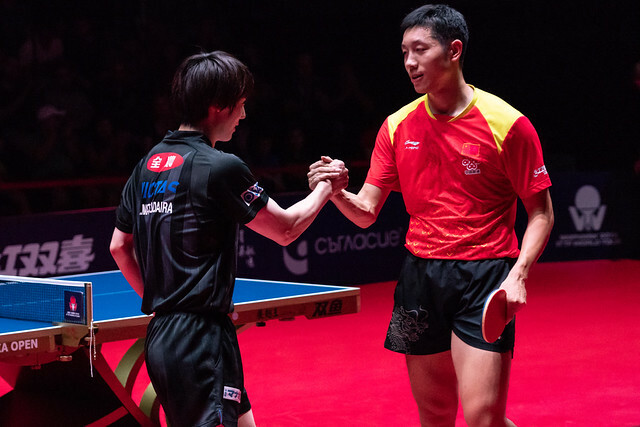 Ding Ning emerged successful at the Rio 2016 Olympic Games, Liu Gaoyang at the Nanjing 2014 Youth Olympic Games; by any stretch of the imagination they were tough opponents for the Japanese duo. Furthermore, in world ranking tournaments, Ding Ning has never lost to Kasumi Ishikawa; the same applies to Liu Goayang against Miu Hirano. A familiar adversary, Ding Ning has now played Kasumi Ishikawa 13 times; today was arguably the best performance of all by Japan’s leading lady. Kasumi Ishikawa has never extended Ding Ning the full distance, in Panagyurishte, as in 2014 in Linz at the Women’s World Cup, it was a six games verdict. She caused Ding Ning more than food for thought. Significantly it was a much improved effort than on their most recent meeting, four weeks ago in Australia at the semi-final stage of the Women’s Singles event, it had been a straight games defeat. Meanwhile, for Liu Gaoyang, it was the third occasion when she had met Miu Hirano on the international stage; previously she had beaten Miu Hirano in 2013 at the ITTF World Polish Open and in the Girls’ Singles event at the World Junior Championships in Rabat. Ding Ning and Liu Gaoyang now meet in the penultimate round, in the opposite half of the draw, the outcomes decided the previous evening, qualifier and colleague Wang Yidi faces Japan’s Hitomi Sato, the no.4 seed. The matches will be staged in the evening session play.